“Dear all sent this, I do not send all emails often as I know people have their own troubles. This though I want you all to know because without your support at the crucial time anything could have happened to me.After YEARS of trying to get a Section 7 Subject Access Request under the DPA 1998 Amended 2000, via Lancashire police, it still needed, even after I paid my £10 and took the 60 miles round trip to hand in my ID, the ICO involvement TWICE and now I have data they claimed did not exist.Among that I consider the wrongful arrest and false imprisonment, illegal detention of me from Nov 2015 to March 2016 with the threat of arrest as soon as I was released from The Orchard.The paperwork has all been changed.The custody records of 7/8/ Nov 2015 I had to get a solicitor to help me obtain them as AGAIN the Gestapo ignored all my requests, faxed or otherwise. It was the first custody record I have ever managed to get and that was the help of a solicitor who would accept no money. His firm had been duty solicitors that night of Nov 2015 and NOT told I was arrested and asking for a solicitor. I was deprived of that basic right as usual. He was intrigued. 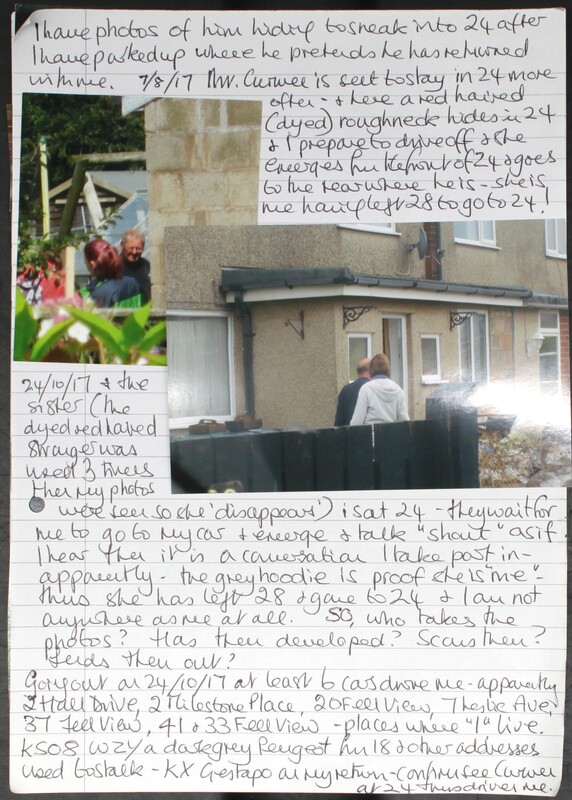 (Incidentally when his firm wrote to me about the arrest of Feb 2012, delivered to 298 Oxcliffe Rd when I rented caravan 1A in Aug 2012, the roughneck Diane Lennon was alerted and she one to pose as me, called to 298 and claimed MY mail freely handed to her by the landlady. When I found out and told the firm they wrote again and that also “disappeared”. I gave up. )I could see when analysing the data that details were incorrect and the FACTS had been recorded wrongly with INTENT. The odd thing then was they claimed they had no names of 3 “NHS professionals” in the station who “sectioned me”. There were other deliberately incorrect details but that is what I add here for you all.In my Sec 7 SAR, AFTER the Gestapo were sent my analysis of how the custody record was totally false, they obviously decided to revise it. Now they don’t even refer to LES MARSHALL who was used as apparently the proof I was mentally ill was that I could not recall speaking to him for about 2 hours. No, I said, I did not forget, I stated I had never heard of him, seen him, spoken to him at all. The NHS confirmed Marshall had not worked for them in Nov 2015, was not in the police station and had not worked for them for years. But see how proof of my stating that was “proof” I was mentally ill.Then more but the 3 on documents I have WERE NOT IN THE POLICE STATION THAT NIGHT AS I SAID ALL ALONG BUT NO ONE WOULD LISTEN. IT WAS EASY ENOUGH TO FIND OUT. I found out but after I was released.What about the arrests: 1) “following someone to a local airport” aside from the fact we don’t have one – deleted from the records. 2) “harassing an 83 year old woman” (how was not stated) when I don’t know any – deleted from the records. 3) “taking photos of children” – deleted from the records. 4) “following someone to Kendal” no date, no person named,- deleted from the records. 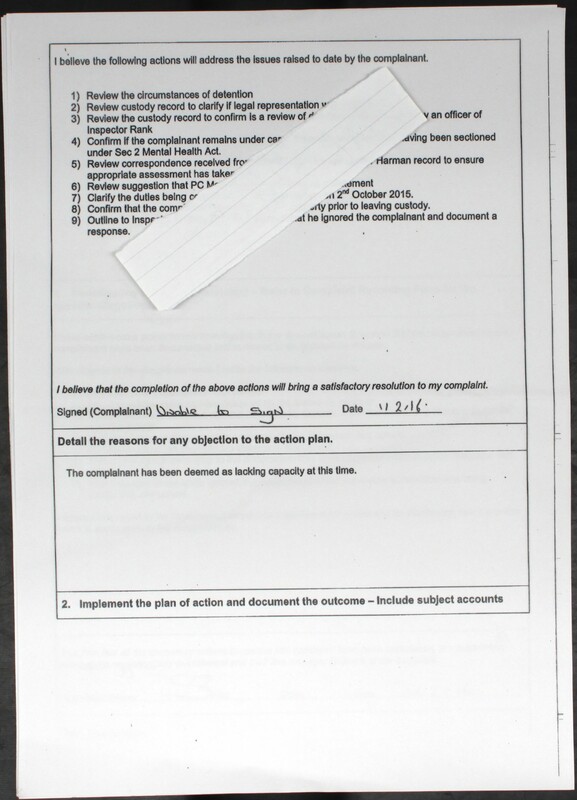 5) “Someone (unnamed) had an injunction ordering me not to write to them” so as I pointed out the lunacy in that was that a person who did not know me went to the expense of going to court to ask for an injunction against me so I would not write to her (I am sure HER was referred to) as if a judge would do that! The solicitor I went to see to help me get the custody records made enquiries about that; there was never any injunction at all as he was sure there could not be on such drivel.The latest “custody record” now has a NEW solicitor named as being on duty that night, one from Preston. AND THAT SHEET OF PAPER HAS MY SIGNATURE AS IF I HAD SEEN IT AND SIGNED. 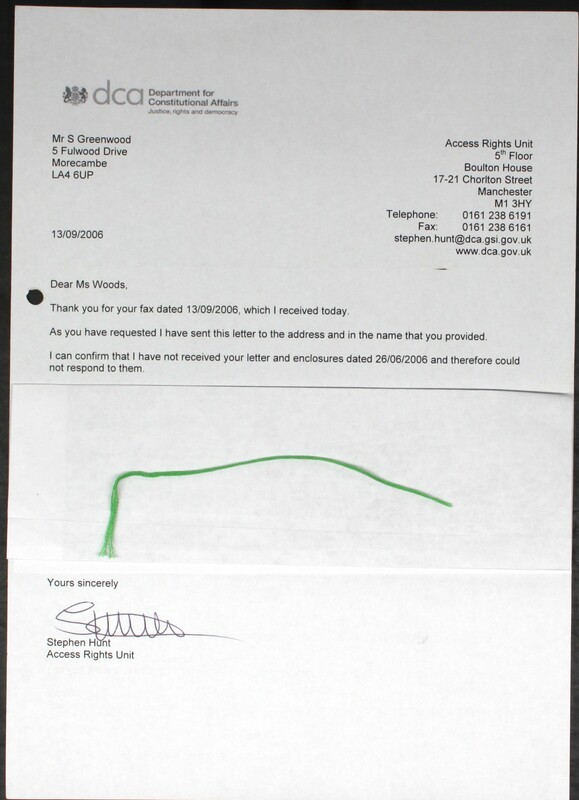 My signature is a photocopied one from the one the solicitor obtained for me. 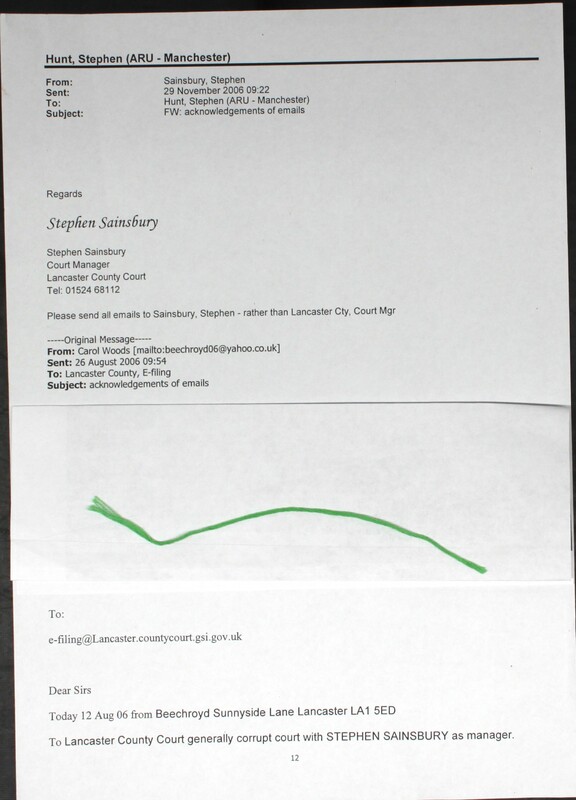 And on those custody records, there is no “south Lancaster” solicitor named at all; it is northern division.And for those who still think I make things up then they have to conceded that my documents are scotch mist.But for all of you who rang and made noises, you were right, I was right, they were wrong. Carol. PS on a cheerful note, the Gestapo records show how they raised FOR POLICE EYES ONLY incident numbers for my “serious crimes” not exposed. One was “She has written to the Crime Commissioner”. I kid you not, there it is in black and white and other such utter rubbish.” [ends]. This data is compiled after a gap of time because when Lancashire Gestapo see how I can show their documents to be drivel, false, and worse, they simply reproduce them with MY comments added as if the earlier versions can be made to “disappear”. Thus I now let the Gestapo know what liars they are and add attachments: see ONE pair of items they cobbled together, they are supposed to be the SAME. I obtained item 2 after making my Sec 7 Subject Access Request which took the intervention of the ICO and after 1 year, the Gestapo STILL have not complied fully. All others and the law is 40 days not a year. But this shows what liars they are and by definition, a liar is a dimwit so here we are. 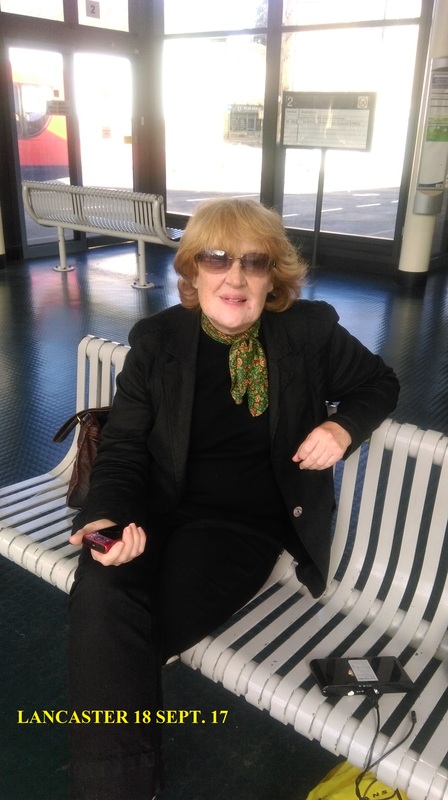 I, Ms Carol Woods under duress at 28 Fell View LA2 9RP formally complained about perjurer PC ANDREW MASSINGHAM who arrested me for VARIOUS “crimes” but couldn’t even get the arrest right which of course the Gestapo decided to claim the arrest was proper when it was not. They altered the time to help them out; thus I complain and the complaint is replied to: I almost had a heart attack: they IGNORE everything and have done for YEARS, yet here they were looking after a bent cop. Oddly, despite this being MONTHS prior to receiving the junk sent to me as per my Sec 7 SAR, none of this was NOT included. For the record: see scanned items [3 items shown directly below…ed.]. This complaint has been received from Ms Woods who is currently under the care of mental health services. In fact I was arrested for crimes (see list) and while locked up for almost 18 hours, they decided I was mentally ill as apparently, I only claimed tom have had the jobs I said I had had. That was far more serious that committing any crime so sleazy individuals were sent for, posed as NHS and claimed I needed “sectioning”. All this is PROVEN on the original custody record which they cobbled together after refusing me a copy as usual. I went to a solicitor and he got then to send me a copy. The receipt says “after receiving my fax” it was not. It was after the solicitor intervened and I had by then sent my fax requesting the records TWICE. I do not scan for you your own document as I assume you have copies. 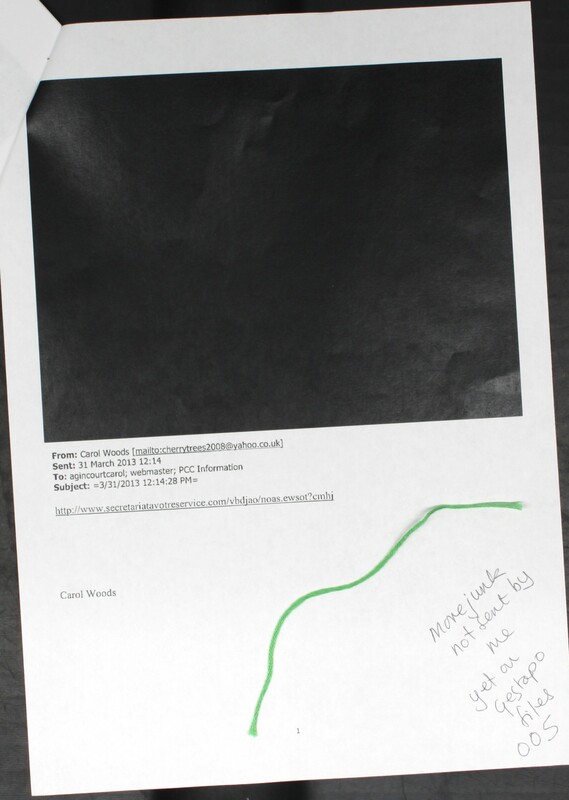 I have added bits of clean paper to spoil any full copies being made as the Gestapo not only ILLEGALLY see what I scan but among papers gained in my S.A.R. they gave me PROOF they copy all I scan and thus give copies to those they want to claim are me with MY documents as “proof”. That was how JUNE WILLIAMS of 30 Fell View gained voluntary work in HMYOI Lancaster Farms in MY name with ID provided by the Gestapo as if she was me with REFERENCES of mine from jobs over years, scanned for my records, ILLEGALLY COPIED to pretend my referees were that bankrupt and drunk bully’s. A) harassment of an 83 year old woman when I don’t know any and no one was named anyway. B) Taking photos of children which transpired was a photo of an event in Lancaster March 2013 yes 2013 where young people dressed up and photos were posed for and taken. On a photo I took, a young boy wanted to get in on the act and was on my photo (and those of others obviously) so I cut him out as he was not dressed up. I sent that to the Gestapo asking if they were their undercover cops; they have no sense of humour so decided after almost 3 years to get their own back! Please ask for copies of that photo. Meanwhile they had recruited local lowlife with children to try to provoke me from March 2014 to hope I took a photo of their children so they could scream I took photos of children. In that the RECORDED and REPORTED RISK TO THE LIFE OF THE TODDLER AND A 4 YEAR OLD at 49 Fell View, Reid, thieves and fraudsters who claim I moved in with them and then they “suddenly come into money” (they are just another pair of brown-noses to act on instruction to the extent of endangering the life of their toddler). Thus all they had was the photo of 4 YOUNG PEOPLE dressed up and unidentifiable. C) Following someone to a local airport which was odd as we don’t have one and even though I was in Barcelona they still found “witnesses” to being stalked by me, someone to “see me” on Fell View while I was in Spain, a photo of my car at MANCHESTER airport with local lowlife at the airport en-route to Tenerife without flight, passports, knowing where they stayed, knowing when they returned, not being able to show any holiday photos etc and then using a silly pregnant teenager to claim she was involved and pregnant in Oct 2015 (the “following by me) and I caused her stress. She was still 6 months pregnant when she told me end Aug 2016. The silly girl and her eventual baby were used by lowlife DALTON in 45 Fell View to claim TRAVIS DALTON was the father and she had been involved with him and his mother for the “holiday”. Then she “disappeared” and T Dalton I guess can’t even pee straight let alone father a child. Unemployed halfwit and all that has FULL details which seems to have disappeared from records; except mine of course. D) Harassing DWP fraudsters and blue badge holders who all claimed to drive me about, by telling them that under the Protection From Harassment Act 1997 I had to give them a warning about harassing me to pretend they drove me about. How does ONE warning constitute harassment? The Gestapo have no idea what “following a course of conduct” means. D) Some had an injunction against me, a stranger who thought I might write to her so she thought she’d get a court injunction against me in case I did and as I told her she was a DWP fraudster and thief, that was a breach of the injunction. E) Following someone to Kendal; the halfwit with the injunction who could not show she had ever been to Kendal. And so on: and ALL that is in MASSINGHAM’s drivel which he refers to as a “statement” which he freely entered into a tribunal and knowing the content to be false is perjury. “Carol engaged in a full M H A and lacks insight into her mental state…………………………… Carol is experiencing persecutory delusional beliefs”. The “FULL MHA” consisted of being asked, “What jobs have you had, after being deprived of food and drink and offered a coffee if I agreed to talk to Mrs Sleazy whose name disappeared from the record and then reappeared KAREN HELME. I was said to be deluded in only having said I’d had the jobs I said I had! BUT THIS, RECORDED ON FORMAL DOCUMENTS, APPARENTLY I WAS SAID TO BE MENTALLY ILL AS I COULD NOT RECALL SPEAKING TO NHS LES MARSHALL FOR ALMOST 2 HOURS. NO, I STATED, I DID NOT SAY I DID NOT RECALL, I STATED THAT I HAD NEVER HEARD OF HIM, SEEN HIM OR SPOKEN TO HIM; THAT WAS PART OF THE MENTAL ILLNESS APPARENTLY. 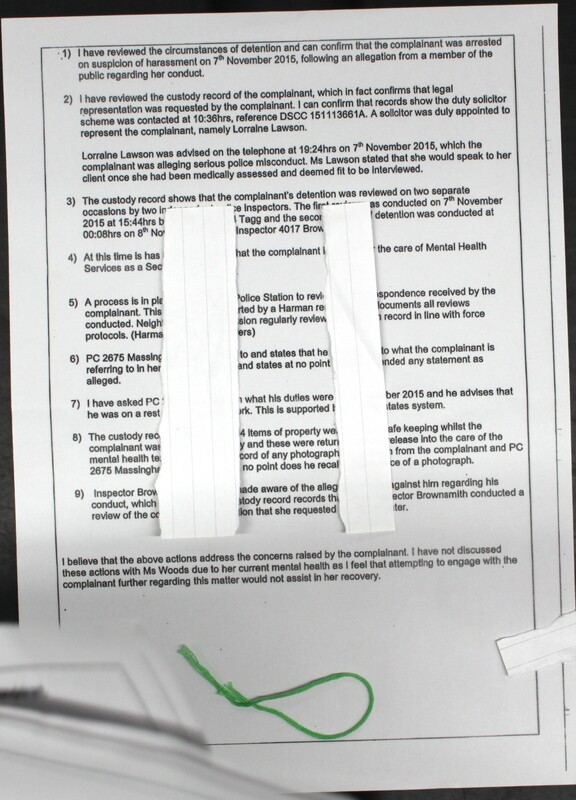 The NHS confirmed to me IN WRITING that Marshall should not have been in Lancaster police station at all as he did not work for the NHS and had not done so for YEARS by Nov 2015. Speaking to Helme for no longer than 8 minutes CONFIRMED ON THE FIRST SET OF CUSTODY RECORDS I HAVE then that was after 10 hours, NO SOLICITOR, despite asking, and then after ANOTHER 8 hours so they were so concerned about me it took them 18 hours of isolation, deprivation of sleep, food and drink and thought I’d “crack up” but didn’t. Enter 3 seedy, NO ID one of whom told me she had heard that my house had been repossessed. Really? I’ve never had a mortgage so you heard wrong. THE NAMES I WAS FINALLY GIVEN IT WAS CONFIRMED TO ME NOT LONG AFTER, WERE NOT WHO THEY POSED AS and the ORIGINAL custody record cannot name them, apparently, anyone can wander into a police station at 1 am and walk about the cells and tell people they are “sectioned”. >>>>>>>>>>>>>>>>>> “information suggests that Ms Woods condition will require long term care”. This was AFTER they found a seedy halfwit aged 76 to call to MY bungalow and hide in her car and PRETEND she had been indoors with me and posing as NHS when I caught her out and challenged her. All on camera. That same seedy was so insane she returned with one even older and scruffier than she was and 2 TWO from the council who all pretended that the 80+ one was a psychiatrist which psychiatrist finding out confirmed she had never met me, spoken to me nor had she ever been to Fell View. Was that the 83 year old Massingham arrested me for “harassing”? 1) Review the circumstances of detention AND THEN CHANGE THE RECORDS MONTH BY MONTH IF NECESSARY TO GET SOMETHING A JURY WILL BELIEVE. 2) Review custody record to clarify if legal representation was requested. IT WAS: I’d had 18 hours to do that. 3) Review custody record………. A review of detention………………. Brownsmith is a liar; there had been no review which is why I now have yet ANOTHER “custody record”. I knew my rights under PACE which is what confused him: they thought I’d be so upset after all those hours of detention with nothing to eat and would not know that a case has to be reviewed every 6 hours. 4) There had been no legal sectioning at all and my name was changed to make me someone else. In CYGNET I became Mrs Carole Woods and an email my son sent me was intercepted as my receiving that suggested I was me which was not the “plan”. JADE KAVANAGH recorded that I walked into Cygnet MYSELF at 3 30am in Harrogate and said, “I am dangerous, I need locking up” and that is all kept safe. 5 and 6) Massingham changed statement and they claim he had not; so I wonder how I have 2 different statements from him. Had they been bright, I’d have been asked for copies as proof. Apparently ALL those “crimes” have “disappeared” and the 7th Nov 2015 was as a result of a complaint ONE from someone unnamed who never produced a statement so how convenient is that? 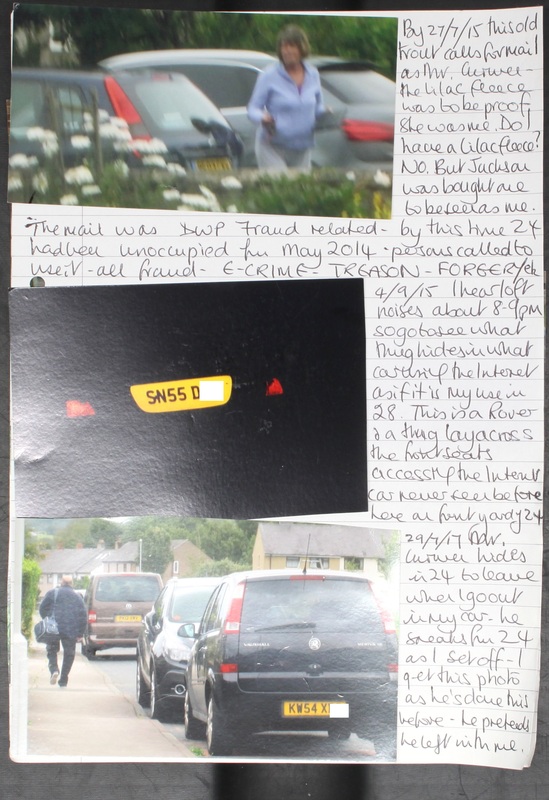 Massingham claims to have called on 5th and 6th to arrest me saying they did not know where I was; LIAR: that is to try to suggest there is NO GPS ILLEGALLY on my car. He had not called at all. The name of a local solicitor is given 19 24hrs apparently she was contacted; but I was arrested at 8 30am; how do they account for that? Where was the DAY duty solicitor? The one named confirmed that she had had no knowledge of my being in the police station at all and that is why this latest junk names ANOTHER solicitor. Why would I have a PRESTON solicitor? I wouldn’t but they want to make me someone from PRESTON so add that. Notice how it claims to be a COPY, when they are not the same and MY SIGNATURE is photocopied: I did not sign this COPY. This lot are so inept and unintelligent, they can’t even follow what they have already recorded. In an arrest of Feb 2012 at MY house taking a photos of officer Tracey Kennedy fraudster, I was held then overnight with the duty solicitor in court asking why I had not asked to see him the day/night before; I said I was not allowed a solicitor. Nor was I ever to get the custody records. That solicitor in court told the bench I was the victim of a gross miscarriage of justice which was why I was released. That solicitor is retired now and was a senior partner in the same firm I called to for help with the custody records of Nov 2015. This clown states that due to my mental health state he will not engage with me further. But it was proven there was no ‘mental health state’ and that thuggery, gas lighting, organised crime and so one were FACTS; staff claimed “Someone’s at the bottom of all this”. Massingham told me I had been given the rank and badge number of TRACEY KENNEDY; liar; despite asking over 200 times, I have NOT been given the information. 2 Oct 2015 reference I claimed I was sure it was Massingham but not 100% sure. However the car had to be booked out and we have my photos to show where the car was and when and why so I can have the name rank and badge number of the driver. And the rank and badge number of officer Kennedy. 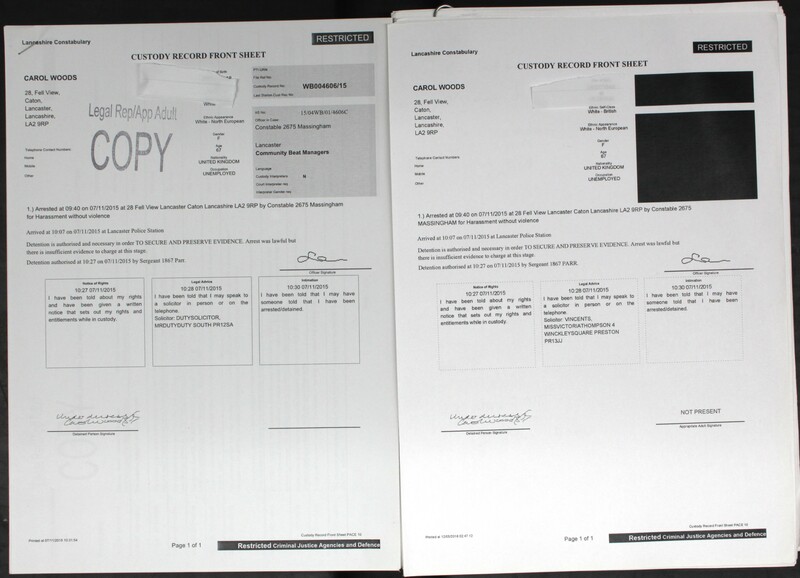 Attached [below] we have 2 TWO custody record cover sheets – one is a COPY of the other but only to a blind man. 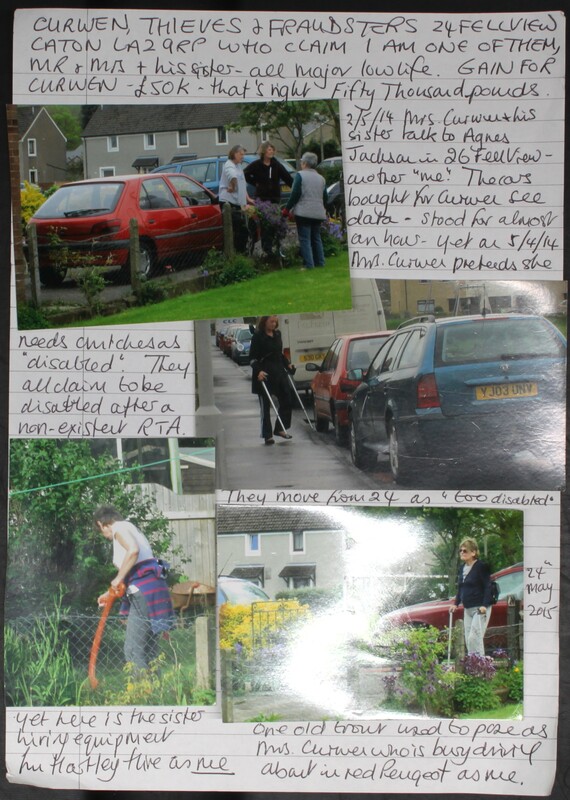 I AWAIT THE PROOF RIPA LEGISLATION WAS APPLIED FOR IN REGARD TO MY CAR AND STILL AWAIT THE LEGAL JURISDICTION OF THUGS AT MY HOUSE THREATENING NEIGHBOURS ON 9/9/08 AND 27/10/08 ESPECIALLY. Kind Regards, Carol Woods. Dear Sirs, Please see the attached one page document which is part of serious organised crime and court corruption. I am sorry for disturbing your reveries but this is England 21st C where justice is supposed to prevail. I am Carol Woods Ms under duress at 28 Fell View LA2 9RP, sorry I have no phone. Please feel free to quote me. 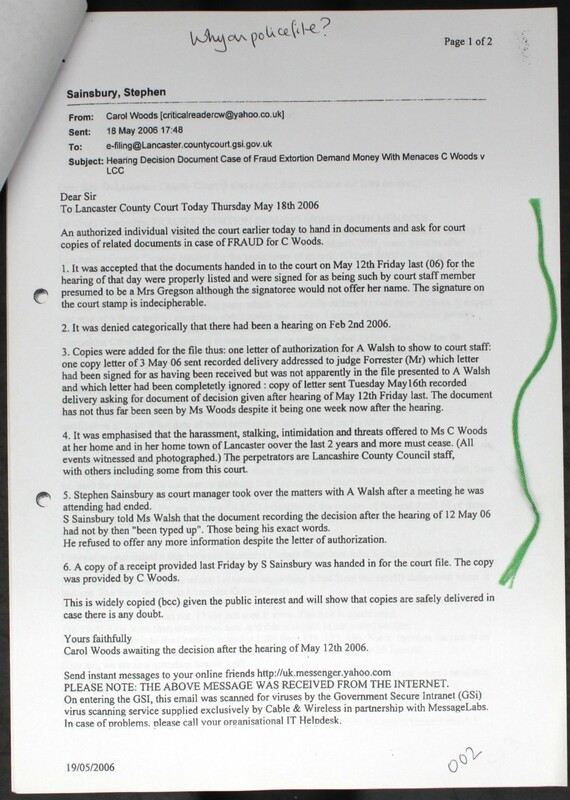 The one page is from my application to have an appeal against the most amazing travesty in Lancaster County Court (all this on proper documentation which NO ONE not even the lunatics of Lancashire can say I have made up) where the judge then GORDON NUTTALL was sacked for his behaviour as I, as a litigant in person, was not supposed to know the law or be able to present my case. The case was against Lancashire County Council for data protection matters. I knew the complex law; the barrister for LCC had photocopied the first 7 sections of the DPA 1998 from his local library (the library stamp was on his pages) and he was so ignorant he thought the law stopped at Sec 7. The whole matter went from bad to worse and without going into all that here, please note the document I attach. I appealed to the next higher court as the travesty I was not going to accept and still refuse to accept they can get away with such. It is not just my case but look at pilot LEN LAWRENCE’s case for example, court corruption compounded by police corruption and swept under the carpet if possible anyway that is possible. In the early years I was ignorant of court corruption but learning fast. MIKE TODD GMP was murdered because of my case and the prosecutions he pursued by the way. This matter was part of the file he had. The next higher court was Preston and I applied. The judge is JOHN APPLETON, freemason of the then Church St Lancaster lodge and now Rowley Lodge Scotforth Lancaster, big buddies with Steve Finnegan Chief Constable (who suddenly retires) and heavy drinker. Appleton insisted on hearing ALL cases against the county and police and always said “The police don’t lie” so no one ever won which is why much was paid in out of court settlements which figures appear to be difficult to obtain. Local solicitors told me it was pointless going to Preston on cases with LCC and the police. I had not known then (2003). Thus at the time, all I knew was that he was a judge chosen to look at my appeal papers: he RESERVED MY CASE FOR HIMSELF WHICH IS ILLEGAL. I had to learn much and fast. The Respondents were involved in my personnel file altering and altering clients’ files to discredit my work as child protection social worker and so on (my punishment for blowing the whistle). 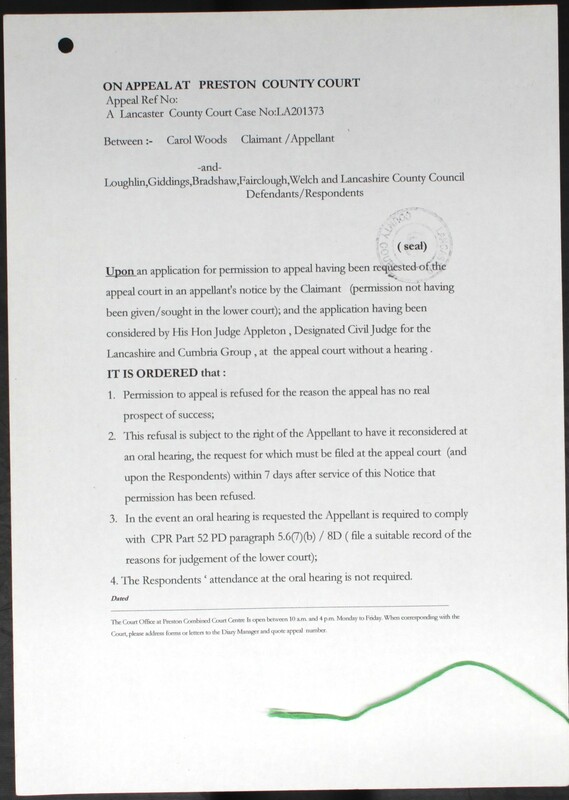 SEE DAVID FAIRCLOUGH, one respondent, his perjury in Lancaster County Court exposed, the barrister nearly had a fit: I was not expected to know the Perjury Act 1911. The judge then needed words with CADWALLADER the barrister and I had to go out and wait! Then they ganged up on me with the result of this appeal attempt. It is ALL on formal records and I forget nothing. The document states that I have not sought or been given leave to appeal. Did I need to ask to appeal a travesty? “No prospect of success” which means I will win and they can’t allow that. I did apply for the oral hearing and was granted one. I took an independent witness with me, one who barely knew me but was experienced in taking notes and her statement is kept safe. I attend the Oral Hearing and we find the case is not listed and the clerk has to go and see what is to take place. An unlisted case is a MISCARRIAGE OF JUSTICE. The court was “closed” and a sop to make me think it was all proper. I had asked for police attendance saying I would declare perjury in the court and I wanted the police to witness the event; Obviously they were going to stay well away but I was naïve then. FAIRCLOUGH as named is now on the crime advisory panel with his old pal GRUNSHAW from social services and party to the corporate manslaughter included in my whistle-blowing. There is no date on the document; it says “Dated” but wasn’t. And note the seal. I was learning a lot about supposed court seals. This one actually says LANCASTER COUNTY COURT so, I ask not unreasonably HOW IS A LANCASTER COUNTY COURT SEAL ON A PRESTON COURT DOCUMENT? You will also note I am to quote the case reference number if I correspond. There wasn’t one: they only used the one from Lancaster County Court: talk about keeping it under wraps. The related COST HEARING FRAUD EXTORTION and more is all part of this and it all has the most compelling evidence of serious crime. And I am left with this alone. And this is ANOTHER case of mine that has no records at all (confirmed by MoJ Access Rights Unit over years) except what I have. make no mistake; these cases of mine from 2002 still have massive repercussions because of the murder of Mike Todd and because of the THEFT, WRECKING and LOOTING of my house. Maybe this is one for LEE SHEEN Home Office who thinks I imagine it all? Background: this is just one video from the list of very informative “IMPORTANT VIDEOS” shown below, with the UK Column’s Brian Gerrish interviewing Carol Woods, from March 2016 https://www.youtube.com/watch?v=3noOtwoNo4Q . The video sees Carol explaining in detail, amongst other subjects: a] the failed “supercasino” project, which was an epic episode in irregularities in itself [also described by Carol here: York LGO Blog re Lancashire CC http://criticalreader2006.blogspot.ae/, b%5D – b] the death of elderly Sheila Bridges, who died after a heart attack, [very strongly allegedly] caused by the actions of recruited and bullying yobs connected to the “supercasino ” project c] the death of former Greater Manchester police chief constable Mike Todd, who deceased after a judge David Williams, connected to the then Social Service’s Upper Tribunals department, was given a file of Carol’s evidence, d] certain Lancs. Social Services irregularities which saw Carol being hounded out of her job for refusing to alter records of vulnerable children connected to Lancs. Social Services, and e] Carol’s move to Lewes, Suffolk, under the advice of MP Norman Baker, which brought on much hostility aimed at Carol, including arrests by police, and the wrecking and theft of Carol’s home = “Child Stealing By The State – A Social Worker Speaks” https://www.youtube.com/watch?v=3noOtwoNo4Q – please see the other videos listed for more background on the atrocious targeting of Carol, which began in 2006 and continues daily now. 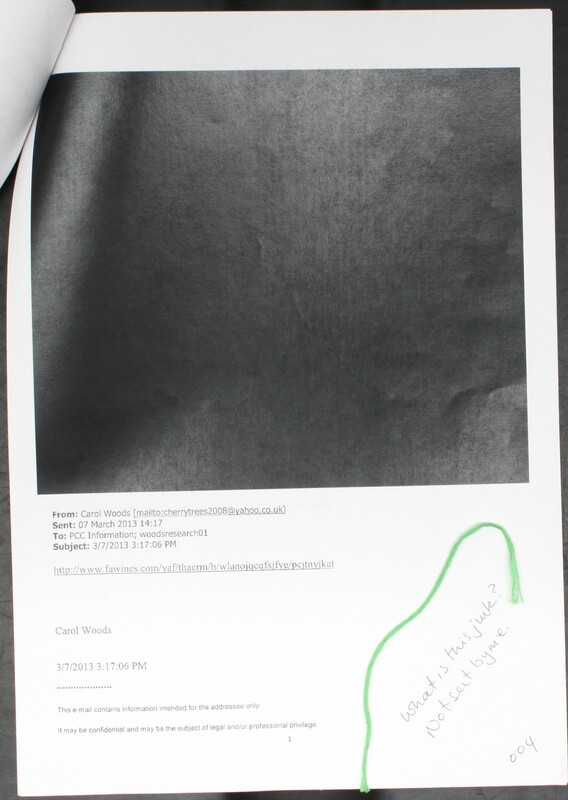 Pingback: The Shocking Carol Woods Coverup: SHOCKINGLY, LANCS. POLICE ALTER RECORDS YET AGAIN! + Lancs court corruption ; party to M Todd R.I.P. + The False Arrests / P.C. Massingham’s Perjury 31 Oct. 2017 + archive — VICTIMS OF THE STATE | World4Justice : NOW! 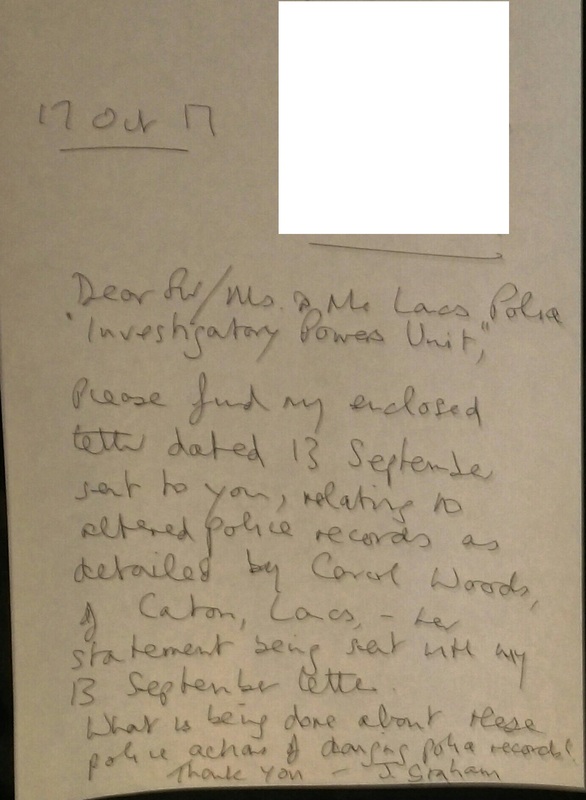 I write to all yet again regarding the serious crimes – including many ID frauds using Carol Woods name, using documents deliberately misdelivered by R Mail postmen to criminal neighbours at Ms. Woods location – continuing wholesale in Caton, Lancs – with the Lancs. police doing nothing about any of the serious cimes reported to them by Carol Woods herself, and myself [to a greater or lesser extent]. My official complaint regarding Lancs. 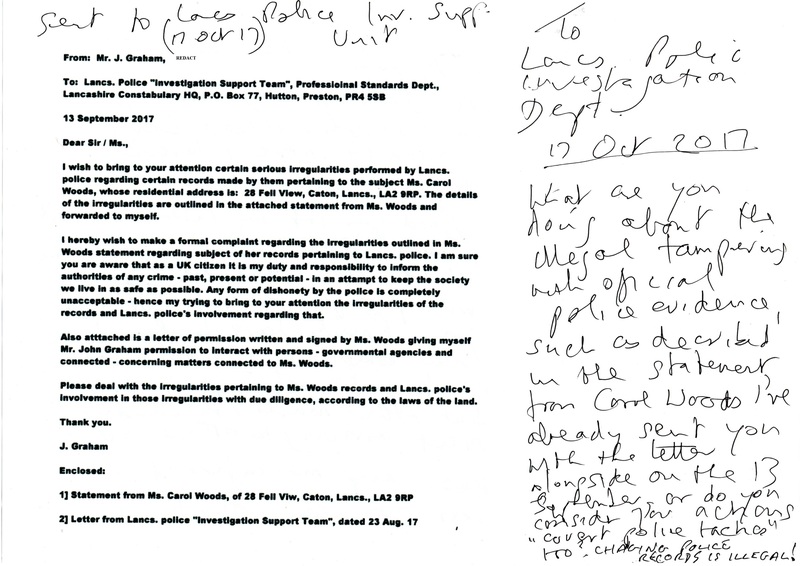 police altering their official records to suit themselves whenever is just one example of their blatant flouting of the law, all kept covered up by the IPCC, and now the IPT refusing to do anything about anything either! It is totally unacceptable that again I have to fork out for the Recorded Delivery fee to send a letter to Lancs. police to chase up letters they ignore regarding their outrageous behaviour – in this instance the altering of official police records.